Louis Van Gaal’s debut match as the newly appointed Manchester United manager went less smoothly that many expected. After conceding possession for the first 28 minutes, Swansea pulled ahead off a Ki Sung-Yueng goal to the bottom left corner of the net. Wayne Rooney tied it up by cleaning up a set piece, a goal that looked much needed at the time. United’s motor was slowing down almost to a complete pause up and a goal to get the offense running smoothly again was necessary. It was all for naught however, the Red Devil’s offense stalled again for a large chunk of the second half and Gylfi Sigurdsson put in the second goal gave Swansea the three points. Manchester United was left with empty possession, and when they tried to breakdown the opposing defense with a long pass, it was typically intercepted or quickly swallowed up. Of the nine vertical long passes United attempted into the attacking third, two were completed and both were swallowed quickly after the pass was knocked down by a United player. Ashley Young started the game for United as a make-shift left-wing-back. While his pace is strongly suited for the amount of running up and down the wing-back position requires, his lack of experience at the position was an early factor in the loss. 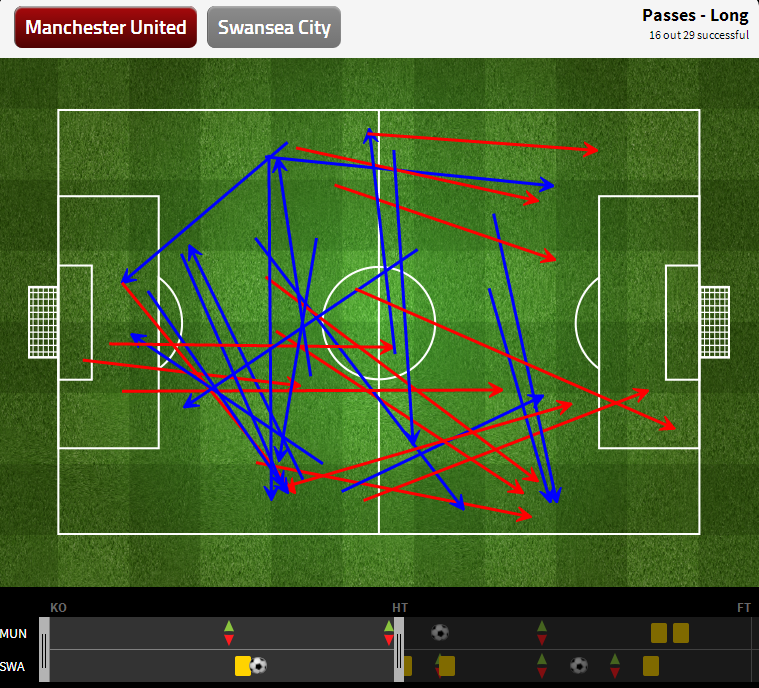 Swansea didn’t attack United often, but when they did go on the attack they were efficient and deadly with the ball. For the first goal, they pushed it out wide on their left side after a long string of passes in their own defensive half. Eventually finding the gap created by Young’s lack of defensive positioning. Once Swansea was in behind Young, they took advantage of of the inexperienced centerbacks of United. 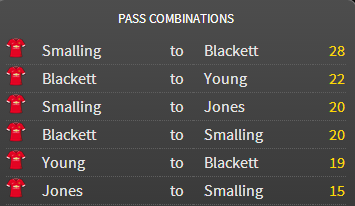 First time starter Tyler Blackett was forced out wide to cover for Young, a pass was fed into Sigurdsson with Smalling and Jones scrambling to slide to the left to cover the middle ground. 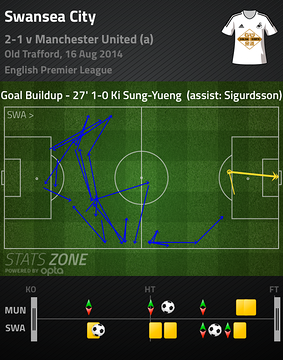 This entire time Ki Sung-Yueng was rushing down the middle. Attacking midfielder Juan Mata was asleep at the wheel on defense, and Ander Herrera and Darren Fletcher were occupied to pay any attention to Ki. Gylfi found his trailing teammate with a short pass and Swansea was soon up 1-0. A semi-related tanget: Swansea came out in a 4-4-1-1 formation, but their defensive shape was more of a 4-1-4-1. Garry Monk had to have taken notes from this past World Cup, because his team came out in a manner that successfully countered Van Gaal’s Dutch side. Wilfried Bony sat extremely far back for a striker, and Ki was much more of a holding midfielder than a box-to-box player. This is why it was surprising to see Sung-Yueng score the first goal. He hardly advanced down the field up to that point, and looked as if he didn’t care much to be involved offensively. It was a brilliant run by the South Korean international. The lone bright spot however came in Adnan Januzaj. Every time he steps out on the pitch for Manchester he seems to shine, and there was nothing different about today. Adnan was strong on the ball for United, giving them an element they didn’t have before. Completing four dribble take-ons from the right wing. When United didn’t visibly force play to go through the middle to Mata and allowed the offense to play freely, they were successful. Unfortunately that didn’t come until it was too late. For the first thirty-eight minutes of the second half, the Red Devils had only created 2 chances. They couldn’t pick up the pieces in time to get the point. Wayne Rooney tied it all up by scoring a bicycle kick of a set piece, and it seemed the run of play was shifting away from Swansea. Without the comfort on sitting back on the 1-0 lead, it was easy to believe that the inferior team would falter. That didn’t happen however, Swansea got behind Phil Jones on their left hand side. Stretched the United defense again, passed the ball towards the middle, and finished it. The South Wales squad only had three real threatening attacks, but they executed all of them to perfection resulting in two goals. United dropped the three points, but clearly showed that they were the superior team. Their major issues come from lacking a real creative dribbler on the ball other than Januzaj and a defense that relied on three young centerbacks to anchor them. Despite that, they could have easily come away with three points barring two major mistakes. The defensive issues are there but fixable, as for their offensive struggles those a more marred with questions. If a team sits back against them, do they have the kind of direct dribbler that will take things into their own hands? Today they didn’t, and if they go past the transfer period with the same roster it could become a long term issue. As for Swansea, a perfectly executed game. The kind of game that nets you three points against a more talented team. This will set them up nicely going forward in the race of teams in the next tier of the Premier League.